For the two hours beforehand, I wondered how I’d let myself get talked into it. But once we were there, suited up and swinging out over nothingness, I wouldn't have wanted to miss it. 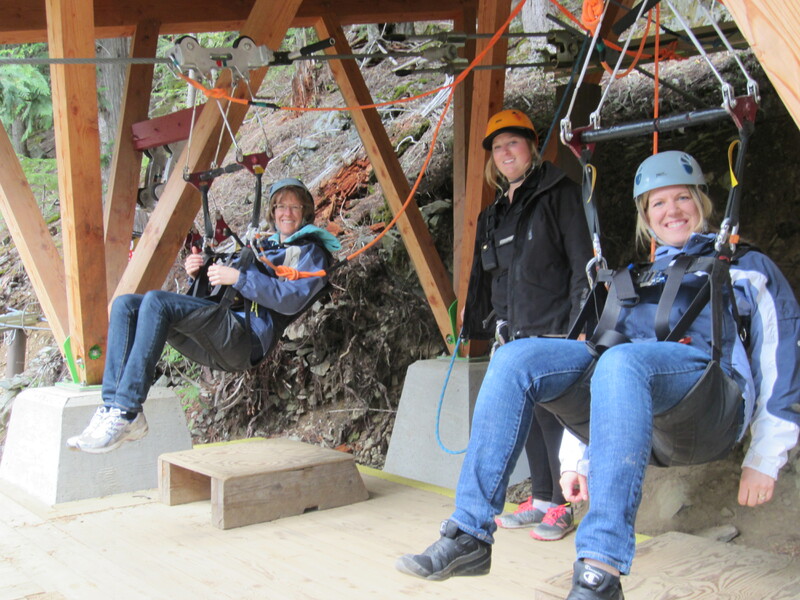 On the first zipline, the view was great, and I loved the feel of the wind in my face. It was fun, and beautiful, but at less than 40 km/hr, there was something in me (yup, even feet-on-the-ground, let’s-keep-things-safe, scaredy-cat me) crying out for more. “Bring it on! Let’s go faster!” The harness was comfy and convincingly safe, and soon I was so eager to rest myself in it and lift my legs from the ground that on one platform the guide had to remind me that I wasn’t clipped in yet. By the end of the third line, our speed was stealing my breath and whipping tears from my eyes so I couldn’t see the view. After the fourth, I was sad that it was over. Life’s a bit like that lately. A call deeper into trust on many different levels. A wondering if I’m crazy to go for it mixed with a longing to live fully. And each time I step through the fear and trust myself to the One holding me, experience Him living His life out in me and calling me deeper, I discover that place of dependence so good that I can hardly wait to do it again. What was it that me take my scaredy-cat hands off the bar and enjoy the ride so much? One thing: Confidence in the harness. I felt safe. We can trust God's grip enough to loosen ours. How do we settle deep into the certainty that we're securely held? Deep enough to enjoy the ride? 1. Watch those who've gone before. I saw the guide strap herself in and zip down the line to meet us at the other end. The line held. It looked fun. I followed. Of all that Christina taught me, one of the most vivid was this: Trust overflows into enjoying the ride. I'll never forget her words, written when she was 32 weeks pregnant and facing her third brain surgery with a baby in the mix: "Is this really my life?? Or am I watching some fun dramatic medical show?? :) I have been assured, this IS my life… and you know what, I STILL love it!" It wasn't that she loved the drama or the pain. She loved her Jesus, loved the way He loved her in the hard places. She loved living the truth that life conquers death, and love fear, and hope despair. 2. Just do it. Make sure you're strapped in, then sit down and lift your legs. The only way to learn that God can be trusted is to trust Him. So go for it. Try letting go of control and see what happens. There's freedom in not gripping life so tight. 3. Don't miss the view. What do you see? Hear? Smell? Feel? Pause long enough to discover that the Giver is sharing it with you because He loves you. He loves you. He loves you! 4. Try a tandem line. Have someone for a meal. Thank the bus driver. Take flowers. Smile at the check-out clerk. Helping someone else discover how much they're loved more than doubles your own joy. So if your adventurous sister - or your pursuing Lover - is calling you deeper into trust, don’t hold back. There might be moments you wonder how you let yourself get talked into this, but you’ll find that the One holding you is trustworthy and the view great, and you might even find yourself taking your hands off the bar and not wanting it to end. What helps YOU enjoy the ride? 1Julie Canlis, "Being Made Human: The Significance of Creation for Irenaeus' Doctrine of Participation." Scottish Journal of Theology. 58 (2005): 434-454. Thanks, Carolyn. Hmmm. What helps me enjoy the ride? I think remembering the beautiful things that have come out of the previous rides. Trust and faith built on the firm foundation of earlier journeys all held together by my Great Shepherd. Thanks for this thought, JoDee. It’s so true. I need to keep remembering the ways God has been faithful in creating beauty in the past when I’m scared to lift my feet for the next bit of the ride. Thanks for this, Carolyn. I’m still not sure about ziplines, but I am sure about Jesus! And I love your quotes from Christina – she was amazing and a great example of how to LIVE! She sure was. And no need to worry about ziplines. Following Jesus is an exciting enough ride that ziplines pale in comparison.